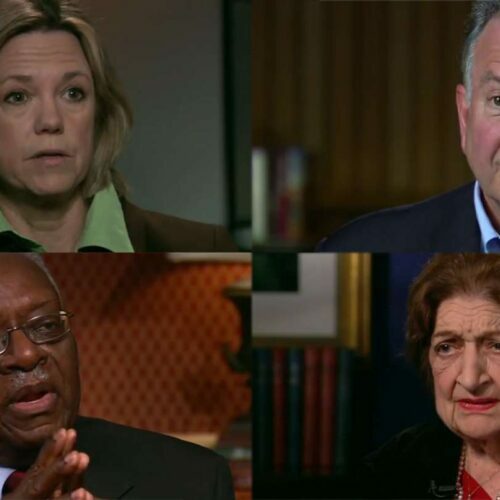 Clockwise from left: Dana Priest, Lowell Bergman, Moses Newson and Helen Thomas Interviews for "Investigating Power"
WHAT: A multimedia project that examines the life and work of the fearless journalists who exposed abuses of power through their investigations and as a consequence changed American history. WHO: Charles Lewis, founding executive editor of the Investigating Reporting Workshop at American University’s School of Communication, and founder of the Center for Public Integrity. SPONSORED BY: American University’s School of Communication, the Center for Public Integrity, the Fund for Independence in Journalism and the National Press Club Journalism Institute. With the future of journalism up for grabs, Investigating Power reminds us in high-definition why the world needs courageous people to produce original, independent, investigative reporting. McCarthyism. Civil Rights. Vietnam. Watergate. Corporate power. Post 9/11. Some of the most influential journalists of the last 60 years talk about the stories that not only shaped their careers, but shaped history as well, in a just-launched project produced by the Investigative Reporting Workshop at American University and co-sponsored by the Center for Public Integrity and the Fund for Independence in Journalism. “At this critical juncture in the history of American journalism, as the news media and the nature and extent of original reporting itself undergo a very difficult transformation, we must reflect on the inherent, incalculable value of original, independent reporting in our nation and in the world,” said site creator Charles Lewis. Lewis has long championed upholding truth to power. He was an investigative producer for 60 Minutes, before founding The Center for Public Integrity in 1989. In 1997, Lewis launched the International Consortium of Investigative Journalists, the world’s first working international network now with 160 reporters in 61 countries. He’s written five books. And today Lewis is a professor and founding executive director of the Investigative Reporting Workshop in the School of Communication at American University in Washington, D.C.
For the website, Lewis sat down with many of the greatest journalists from the last century including Murrey Marder, Carl Bernstein, Bob Woodward, Moses Newson, Ben Bradlee, Dana Priest and Seymour Hersh and more than a dozen other leading reporters, along with the now deceased Mike Wallace and Daniel Schorr, in never before seen interviews. Lewis spent more than five years researching and creating the website in order to faithfully record, for the first time, journalism’s impact on history from the very people who did the reporting. He plans to add additional footage as the project continues. The project will also form part of a book Lewis is writing, “The Future of Truth: Power, the News Media and the Public’s Right to Know” (Public Affairs), which is expected to be published in 2013. To celebrate the website’s public launch, Lewis is moderating a discussion at the National Press Club in Washington D.C., beginning at 6:30 p.m. Wednesday. Panelists include Bill Kovach, former Washington bureau chief of The New York Times, Dana Priest, national security reporter for The Washington Post and Barry Sussman, former Watergate editor at The Washington Post and now editor of the Nieman Watchdog Project at Harvard University. Investigating Power is likely to become the most bookmarked website for journalism students across the country for decades to come.